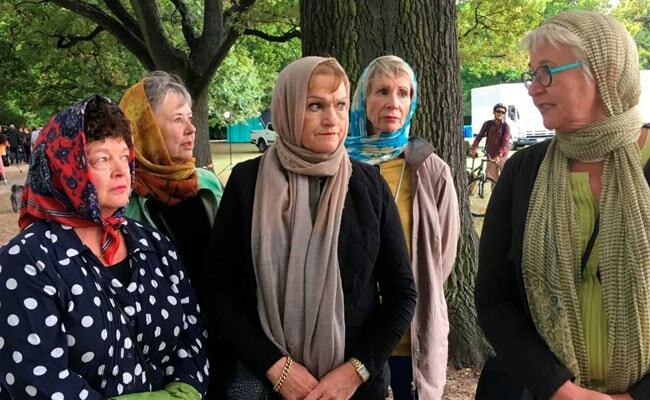 Women all over New Zealand put on headscarves on Friday to show solidarity with Muslims a week after 50 people were killed at two mosques in the city of Christchurch. A doctor in Auckland, Thaya Ashman, came up with the idea to encourage people to wear a headscarf after hearing about a woman who was too scared to go out as she felt her headscarf would make her a target for terrorism. "I wanted to say: 'We are with you, we want you to feel at home on your own streets, we love, support and respect you'," Ashman said. As Christchurch geared up for prayers at a park in front of the Al Noor mosque, where most of the victims were killed last week, women in Auckland, Wellington and Christchurch posted pictures of themselves in headscarves, some with children in headscarves, too. "Why am I wearing a headscarf today? Well, my primary reason was that if anybody else turns up waving a gun, I want to stand between him and anybody he might be pointing it at. And I don't want him to be able to tell the difference, because there is no difference," said Bell Sibly, in Christchurch. In an unsigned opinion piece on Stuff.co.nz, a Muslim woman called the movement "cheap tokenism". "The attack in Christchurch was not just about Muslims, it was against any person of colour in a 'white' country so this focus on hijabs is derailing the examination of white supremacy, systematic racism, Orientalism and bigotry," she said. "It is a symbol of purity culture antithetical to feminist values. We have women in jail and dead, for refusing the interpretation of Islam you promote," Ms Nomani said on Twitter.